MADDY PERSONS takes a jump shot against Clarke on Tuesday. She scored five points in the game. The Albia girls basketball suffered another tough loss to a top conference opponent, but Coach Katy Dykes sees incremental improvement, even against a 57-24 loss. “We proved early that we could play with Clarke,” she said. “We played really well for a quarter, then fell apart in the second, outscored 25-3. Then we came back in the second half and played Clarke to a 17-15 game. 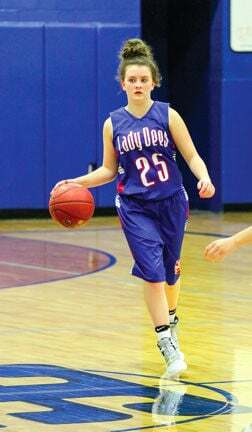 The Lady Dees avoided the kind of lop-sided first quarter they suffered against Knoxville and Centerville, playing within five points most of the first eight minutes. A couple of traveling calls and errant passes led to some easy baskets as the Indians went up 15-6 at the quarter break. Albia couldn’t buy a basket in the second quarter and Clarke couldn’t miss as the game got out of hand. Coach Dykes made some halftime adjustments and the Dees basically played basket for basket with the talented Indian team in the final two frames. Carlie Ford led the team with seven points and had four rebounds. Maddy Persons added six points and two rebounds. Taylor Colwell scored four points with two rebounds, Rylee Leshen had two points and two rebounds, Danica Workman, Haleigh McDonald and Allison Major had two each and Halle Hindman one. Lauren Kaldenberg did not score, but had one of her best rebounding games of the season with eight. She also had a blocked shot. The Dees are finally home a game after spending most of the pre-Christmas schedule on the road. They play Davis County (4-4).